I woke up on Saturday morning feeling strangely unwell. I mentally ran through what I’d eaten the night before and counted up the glasses of Cava, before I registered that the sick, traumatised sensation in my stomach was simply the realisation that the previous day hadn’t been an awful dream brought on by too much camembert. We really had voted ourselves out of the EU and into the abyss. On Sunday I felt exactly the same. By that time, we could add to our list of outcomes not only that the pound had crashed and the markets crumbled and that big companies were signalling their intentions to move away from the UK, but that the Labour party was in crisis, nobody from the Tories was seeming ever so keen to be the one to trigger article 50 and in fact a lot of them seemed to be wandering about in confusion wondering what would happen next. I’ve had my fair share of flak on Facebook for expressing my shock and shame and I have been urged to accept the workings of democracy, to respect the wishes of the majority and to stand firm against the divisions which have sprung up between those who voted to Leave and those who wished fervently to Remain. All well and good and laudable. But what do I do with my rage? I have always respected the political opinions of others – I have friends on the right and the far left and the wishy-washy centre (where I usually reside myself) and I will listen to anyone with an intelligent, informed view. And there is the rub. I feel no animosity towards, say, Craig Mackinlay because I know our South Thanet MP has a brain, is an accountant and voted from a position of unshakable conviction based on his own (even if in my view, mistaken) economic analysis. Ditto any of the members of Westminster who went that way although I note that Boris is not looking particularly jubilant now – time will tell what his particular stance was all about. But I cannot recover from my fury with the ignorant. Or those that fed them the lies. My esteemed colleague on this column, Mike Pearce, has always taken the view that some people are too stupid to vote and I have always squealed with horror. Finally, reluctantly, I feel forced to agree. But the responsibility lies with the likes of UKIP leader Nigel Farage, now distancing himself from any suggestion that the EU contributions could go to the NHS (not what you said a few weeks ago, Nige!) or the Conservative MEP Daniel Hannan who has finally admitted that coming out of the EU will not result in reduced immigration. Many, many voters were sold a vision of a Britain that cannot be delivered and they won’t realise that until much too late. For those of you who will respond by telling me I am wrong, then let me answer you now that I so dearly hope I am. In the meantime, I still feel sick. What, oh what, have we done? You can read the original post at http://www.thanetgazette.co.uk/plain-jane-after-the-eu/story-29462228-detail/story.html. A GOLD STAR for Southern Water’s customer service. Last Saturday I answered the phone to a nice lady called Denise who informed me that our water meter reading had been taken and our bill was much higher than usual. Rather than sending out an invoice for a scary amount, she was calling to enquire if our usage had dramatically increased. Having waited politely while I interrogated my son on his bathing habits and faucet-shutting prowess, she explained that even if he had cleaned his teeth with the tap running (a practice I have long attempted to crush) we were talking a very large quantity of H20 for three people to consume, and we probably had a leak. She then texted instructions as to how I could find out. On Monday I braced myself and phoned the number I’d been given to report that yes, it seemed the meter was still moving even when the water was switched off, and what a shock I had. There was no “press one for a payment”, two to change my address or three to listen to mindless music for forty minutes and then cut my throat. Instead, the phone rang and someone answered! Just like that. And an equally lovely-sounding Sarah said she’d send an inspector round this week. If anyone has had any recent dealings with certain other infuriatingly inefficient and almost-impenetrable utilities (to mention no names, British Gas!) you will understand my almost speechless wonder. THE Taxpayers Alliance wants the proposed “sugar tax” to be axed, as it fears it will adversely affect the poor. Its reasoning is that the tax will not apply to all sugary drinks across the board but will target those more likely to be purchased by families on low incomes. It offers as an example Coca-Cola (10.6 grams of sugar per 100ml) which will be subject to the levy, as opposed to a Starbucks’ hot chocolate with whipped cream and coconut milk (11 grams), which will not. The organisation also notes anomalies such as “energy” drinks being taxed (11 grams) but not Tesco chocolate milk (12.4). I quite see where the TPA is coming from but surely there’s a much simpler answer. If we really want to make things fair and save the poor NHS from buckling under the weight of obesity, then let the government ban sickly drinks altogether. Make it illegal to sell any soft drink containing more than a certain level of the sweet stuff and have done with it. They’ve come for the smokers and the drinkers. Fatties – it’s your turn next! 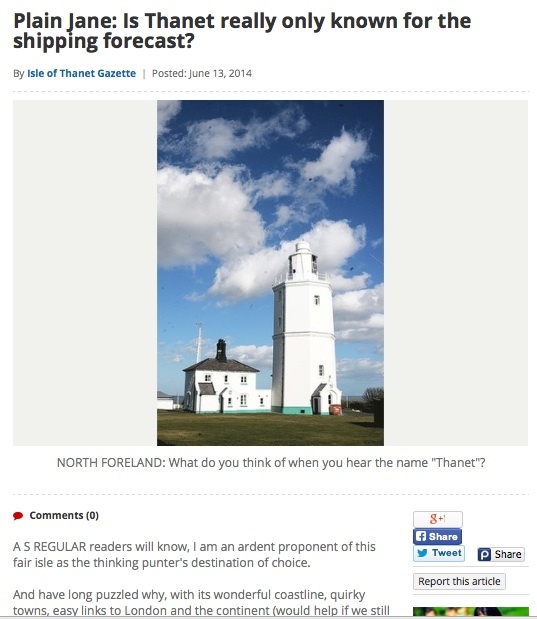 Plain Jane 130614: Is Thanet really only known for the shipping forecast? Plain Jane: Is Thanet really only known for the shipping forecast? As regular readers will know, I am an ardent proponent of this fair isle as the thinking punter’s destination of choice. And have long puzzled why, with its wonderful coastline, quirky towns, easy links to London and the continent (would help if we still had an airport, of course, but I’ll contain my wrath on that one for this week), it isn’t positively blooming a la, say, Whitstable. Or Aldeburgh. Or any number of any places that haven’t actually got any more to offer than we have but manage to be chi-chi and sought-after in a way that our neck of the woods still doesn’t quite manage. If the area were a book, I would suggest a relaunch with a new title and cover design. Because not only is “Thanet” a particularly unlovely word – but nobody has ever heard of it. And even if they have, they don’t know where it is. I am writing this from the ever-fabulous Chez Castillon in the Dordogne where I usually tutor others who wish to be best-selling authors (you know what they say about those who teach) but on this occasion am being forced to swallow my own advice. That is, I am “on retreat” charged with producing a huge swath of the novel I should have finished two years ago, before my agent has apoplexy. By way of experiment I threw the question open to my companions, a bunch of intelligent, sophisticated, well-travelled writers. “What does ‘Thanet’ mean to you?” I enquired in jolly tones at breakfast. “Totally Happy And Not Ever Terrible,” piped up Clare, which wasn’t a bad effort for a woman with a hangover. “Rhymes with Gannet,” offered Katie, who’d also had a late night. “Where is it?” I tried. “Sounds as though it should be near Reading,” said AJ. “It’s where the oysters come from,” said Jo, who was at least in the right county. “It is on the coast,” declared Judy with authority. Where exactly? I asked. “In Essex”. “I only know where it is because you’ve told me you live there,” finished Clare. A search of Google is no more inspiring. “Thanet is a local government district of Kent,” drones Wikipedia, hardly making it sound like a must-go. Next up is the website for Thanet District Council (and if that won’t put ’em off nothing will) followed, as I type, with a photograph of the local Tory leader leader Bob Bayford on this very newspaper’s website, who is trying to be gung-ho about his party’s chances against Ukip. Nothing is screaming Glamour, Style or Come Visit Me. And even if, like me, you spend every bank holiday thinking that might actually be a damn good thing cos there’s enough of ’em clogging up the pavements already, in the absence of any other notable industry, visitors are Thanet’s best hope of future fortune. I am wondering if we shouldn’t go the way of Staines in Middlesex who, in 2012, renamed themselves, Staines-upon-Thames in an attempt to go upmarket. Would “Thanet-Upon-Sea” work? “Thanetstable”? “Thanetgate”? “Thanet-really-not-that-far-from-the-M2-honest”? RECENT figures have shown that 24,000 children each day are taken out of school for a family trip. If I still did the school-run, it might well be 24,001. I believe in a proper education as fervently as any Education Secretary, but I have nothing but sympathy for the 200,000 parents who have signed a petition demanding a change of heart from Michael Gove on the vexed matter of time off from the classroom. If my child were of that age, I’d have added my name too. And if I’d been the mother of the girl from Staffordshire recently refused leave to attend her grandfather’s funeral, it would have been more than a petition I was waving. We asked permission to take our son out of school on several occasions, for a variety of reasons – not just because my husband suffers an allergic reaction both to other people’s children and paying through the nose (if the government really wants to stop families going away in term time, their best bet would be to ban the airlines from inflating their prices the minute the kids break up) – and were never refused. I was always polite. I always promised missed work would be made up. I would generally emphasise the learning opportunities of my son spending, say, two days on a road trip with his father, taking in sites of cultural and historical interest (and keep quiet about the bribe I’d offered him if he begged to see Ely Cathedral or Brunel’s SS Great Britain, because I had a book to finish). But how much of a lasting impression these outings had, I cannot say. Asked to recall educational jaunts taken with his fond parents, my son wrinkles his nose. “There was a big old house we went to”, he recalls, “when dad was in a bad mood” (This did not help to narrow it down). “And that air memorial place when you stayed at home (This turned out to be the Imperial War Museum, Duxford). His warmest reminiscing is reserved for the morning the whole class were allowed to stay at home while England played Brazil in the World Cup. Nevertheless, I am firm in my stance. While clearly children must go to school as much as possible to have a fighting chance of knowing how many beans make five, there are many of life’s small nuggets of experience that cannot be met in the classroom. There can be many reasons why families may need to take an occasional holiday outside the traditional breaks, or visit far-flung relatives at short notice, and some encounters will be just as valuable as double maths. As parents, we should be allowed to make that judgement call. I remind my son of art galleries in Florence, mosques in Egypt and the boys weaving baskets from bamboo leaves on the white sands of the Dominican Republic. “That’s why I’m rubbish at Roman numerals,” he offers. “They did them in Year Three when we were in Lanzarote.” This is the first time I have been appraised of this gaping gap in his knowledge and am suitably shocked. “I can teach you those,” I say, rattling them off up to ten (X). The boy looks at me witheringly. “Even I know that far,” he says, correcting me onwards from four. I HAVE just returned from a week teaching a course at the fab Chez-Castillon in the Dordogne. I left home at 4am to get to Heathrow and sat in hours of traffic on the M25 on the way back. From the moment of the plane touching down to my walking in through my front door took over four hours. The last time I returned from Bordeaux, the same transition was completed in under 40 minutes. So yes, thank you Ms Gloag, I am still cross about Manston…. So another shake-up for our beleaguered local government. In-fighting and power struggles down at Cecil Street are nothing new, of course, but I am genuinely sorry – and not a little shocked – to see Clive Hart resign as leader of Thanet District Council. I do not know enough about the shenanigans that led to his making this decision – his Facebook statement sounds like that of a man who has just felt the final straw land on his already straining back – but I am sure of this: hopeless and incompetent as our council as a whole can appear at times, you can divide the parts of its sum into two distinct camps that have nothing to do with manifestos. There are those who, despite being the sort to actively seek a position of local power and responsibility in the first place (personally I would rather chew my own leg off), are in it for the “right reasons” ie. they actually do want to help make Thanet a better place in which to live and work, and have a sincere interest in dealing with its pockets of deprivation and boosting its fortunes on a wider scale. Then there are the others, who enjoy the column inches and the lunches, are thrilled by the sound of their own voice (perhaps I have missed my vocation after all) and see every debacle as an opportunity for another promotional sound-bite and a chance to get on YouTube. Let’s face it, TDC does not need much to give it a bad name – with its fine history of corruption, pretence, prison sentences, ludicrous charades (I am old enough to remember the Councillor’s-mate-dressed-as-Sheik Gate, as well as all the forged money and rumours of back-handers) – but the latest crop of self-seeking party-hoppers, who will jump on whatever bandwagon happens to be rumbling by, if it gets them an interview, sure as hell aren’t helping much to polish up the image. This is not a party-political rant either – there are a selection from both groups across the board – but more an expression of sadness that the former are driven to despair and resignation by the latter and that it is always the few rotten apples that we recall. I understand that by the time you are reading this, Councillor Iris Johnston will be heading up the Labour lot and I wish her well. I do not know Iris in any depth but I have seen her in action at GGGs (Gatherings-of-Great-and-Good) around the isle and, as I once commented at the time, I like a woman who bears down on the drinks tray with the same alacrity as I do. I would also like to see a woman have a go! My colleague Mike will be delighted because he has been so rude about the feisty Ms Johnston over the years, that he clearly harbours a secret and unrequited passion; and we should all be relieved for now, as I fondly imagine Iris to be the right-reasons kind and they are the only ones who, long-term, will get us through. Let’s hope she has the stamina and steel to deal with the rest of ’em! 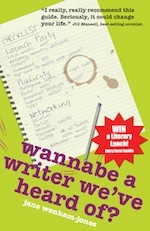 Very pleased to be featured on Sarah Salway’s website and thanks Sarah for the plug for Thursday’s event at Canterbury, Waterstones too. Also thank you Edith for this article discovered by the splendid Morgen on her web travels.